Lake Hayq is located in the highland of northern Ethiopia. The Lake is a home of different fish species, water birds and aquatic organisms, but it was without Nile Tilapia and currently the ecosystem is dominated by the introduced Tilapia fish. Tilapia was introduced into the lake in 1978s. Since then it has been become commercially important species in the region. Before the introduction the fish, the lake has a clear-water, but currently the lake is turned into eutrophic lake probably due to the omnivorous nature of Nile tilapia. 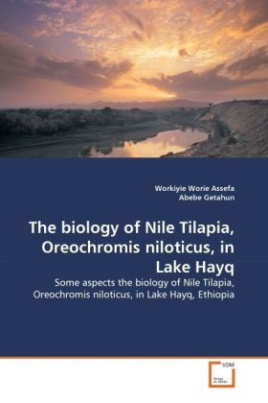 This monograph, therefore, provides new insight regarding to the biology of Nile Tilapia in such dynamic ecosystem. The book covers the food and feeding habits, some reproductive aspects and the length-weight relationship of the fish. Similarity in the composition of the diet between size groups also assessed using the multivariate statistical software CAP. Hence, the monograph is written to those professionals who engaged in aquaculture, fish biology, environmental biology and fishery fields, or anyone else who want to know the biology of exotically introduced Nile tilapia in completely new & different habitats.